Would he do it on a cold rainy night in Stoke? 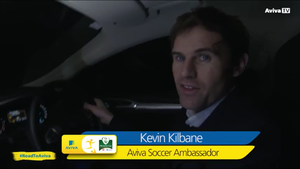 Former Irish soccer international Kevin Kilbane dusted off his boots earlier this week to train with and coach Blessington FC as part of the #RoadToAviva inititive. The initiative is aimed at clubs eliminated from the FAI Junior Cup to “shape up and get back on track” for next season. For me it was strange getting out there again, but great. I thoroughly enjoyed it and I really miss every day on the training pitch. There were a few bobbles out there, but that’s what it’s about, that’s what these lads play on and have to deal with. Can Someone Please Explain The FAI Ticket Scandal? Jeux Sans Frontières Is This A Record? Posted in Sports and tagged blessington fc, FAI, fai junior cup, kevin kilbane at 4:40 pm on November 12, 2015 by Aaron McAllorum. yeah kilbane, repeat instructions to pass it back to the keeper doesn’t count as a training session. granted he’s a lovely fella, but he’s scared sh1tless of the halfway line. It’d be easier pushing an *actual* donkey up the pitch. Like so much in life, there’s an awful lot to be said for always turning up. One of the best headers of a ball the Republic have ever had. Nothing could be further from the truth. He was one of the most attack minded last sides players we had. Infact, if he did have a fault it was that he spent so much time running up the line into a forward position that he could never get back in time to cover a counter attack.